US bettors have ample reason to stay up late every Sunday night watching their favorite football team play. 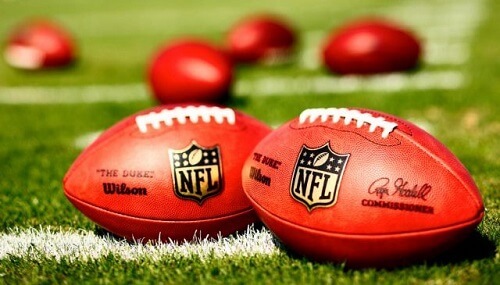 The National Football League (NFL) consists of multiples games throughout the calendar year that bettors can wager on. From regular and postseason games to playoff games that all lead to the Super Bowl. Find out how to bet on sports in Vegas and/or at any of our trusted online sportsbooks. Follow these steps and win big. There’s a total of 32 NFL teams divided into divisions around the country. The winner of each division does not necessarily become the team on the podium in the Super Bowl. This is because some teams perform well during regular season and burnout when it counts the most. Bettors get a chance to compare NFL predictions from expert analysts alongside sportsbooks. The predictions are based on the team’s recent matches, regular season form, log standing and the history of the head-to-head matches. Learn how to bet on American football below and win big. Moneyline Betting Odds – the most popular of the three bets, it defines betting on the eventual winner of the match. Sportsbooks indicate the overwhelming favorite to win the match with a negative sign and the underdog is signalled with a positive symbol. Spread Betting Odds – The point spread betting option is popular among high scoring sports, which the NFL is. It relates to the number of points that the favorites have to reach in order for the bet to win. Not only should the favourite overcome the handicap margin, but they have to win the game as well. Total Betting Odds – This type of bet is one of the safest bets of the three. It requires the bettor to predict the final score to be over or under a specified number. Since American football is a high-scoring sport, it makes betting very interesting. There are numerous NFL wagering options for bettors in the USA. It is possible to bet on live and future games, including increasing their potential payout by adding multiple bets to their ticket. They will need to choose a legitimate online betting website first. Follow these steps to understand how odds work in football. Step 1 – Select any of the sportsbooks that we’ve thoroughly vetted and reviewed. 2 – Deposit funds into your account. 3 – Choose your favorite game in the NFL that you are confident regarding the final score. 4 – Pick a type of bet, single or multiple games and bet live NFL games. Managing your bankroll is the first step towards sustaining a good run gambling online. This means setting aside money that you can afford to lose through gambling. Since the NFL takes place over a period of six months, bettors can sustain some level of interest in the game. This relates to knowing the teams and being able to watch NFL games. Compare the betting lines and odds of the different sportsbooks to choose the most profitable bet. Every bet should be informed by some kind of statistic and backing. Bettors should not bet solely based on their favorite team. Now that you have an idea of what it takes to win when you bet on NFL games, head over to any of our recommended online sportsbooks and bet to win.